After I finished my home tour blog post, I realized there were a lot of my favorite parts of the house not even documented! So I wanted to give you guys a glimpse at the little details, and where you can get some of them! I originally had our dish drying rack behind the sink and it was such an eye sore. So this weekend I used some old pots we had, grabbed some fresh herbs from Wal-Mart, and snagged these cute cedar crates from a junk sale outside Woodstock Market. LOVE this little space so much more now. 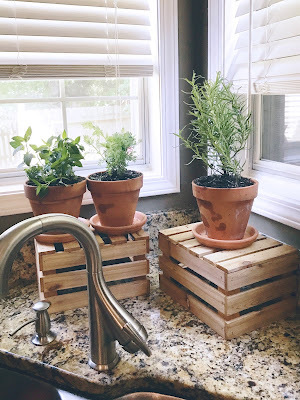 In an effort to de-clutter my counter tops with the newly added herbs, I moved this stuff over to our breakfast nook table. I normally keep fresh flowers here, but it never felt put together. Love this look so much more! When I decided to not have the gallery wall from our LA apartment, I struggled with what to do with all the little pieces. These are things from three different areas of our old house, and I'm digging how they spruce up our upstairs hallway now. These were super cheap finds from a Classy Flea in Marietta. Love the lamp light and pop of green in our bedroom. I have ordered so many prints from Canvas on Demand, and this is by far my favorite. I LOVE this picture so so so much, but I do feel like its an intimate/special picture, so I like that it is tucked away in our bedroom. Hello, my name is Anna-Grace and I have an obsession with lamps and plants. HA This is my favorite room in the house - our dining room! I grabbed this lamp from Woodstock Market, the old window frame from a Classy Flea and the wreath HERE. Love this little setup on our entry way table. Kelley gave me this lamp because she couldn't find anywhere in her house to make it work. (And now it is the most complimented thing in mine, ha!) 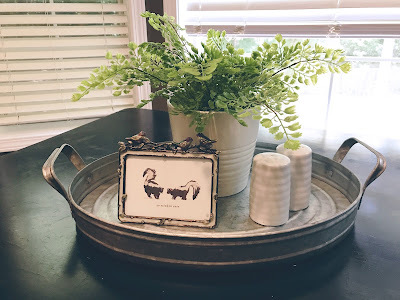 Plant and tin are from Ikea and picture frame is an old Hobby Lobby find. Now that our house is done, what do I do with myself?? Pin ideas for fall and Christmas! Looking forward to decorating some more!! So many good images & nooks. I love the window frame + wreath and entry way the most! !